Aaron Landsman’s Running Away From the One With the Knife, 2015, in a production directed by Mallory Catlett. Performance view, The Chocolate Factory, Long Island City, New York. Christina (Kate Benson). Photo: Brian Rogers. See two plays, one written by a woman and directed by a man, the other vice versa. Discuss within larger context of progressive New York performance. There is the almost-identical table in both shows. I notice this Friday night on my way out of the Chocolate Factory, with a happy little shock of recognition. I like this table detail a lot. Rusted legs, curving rectangular top. Slight variations on a theme. Thinking about the ways in which artists send messages to each other, embed secrets, within their work. Sara C. Walsh designed the Social Security set, and Running Away was created by Jim Findlay, who also did sound design. Both worlds are beautiful, unexpectedly, and hard. Walsh makes the stage into a triptych, beige layer cake of faux-everything: wall-to-wall carpeting, linoleum, floorboard laminate. Canned food. Findlay gives us the illusion of movement within stasis, freestanding, semitransparent walls that open and enfold, disgorging from various compartments cheap coffee and chemical cleaners. Perfection (fetishization?) of a sort of barren junkiness—post avant-garde NYC aesthetic? Or maybe post-comfort. There’s nothing to hint at the possibility of change for the better in these productions, both of which (spoiler alert) zoom toward the death of a central character, each possessing a certain empty charisma. Compare and contrast: In Landsman’s play, Christina (Benson) is the one with the knife, and she will eventually find a way to use it (or the next best tool) on herself. Masciotti’s victim is June (DeMent), and she’s also a talker—unlike Christina she doesn’t spin hypothetical death futures, but run-together memories of the past. They both have manipulative relationships with handymen who aren’t quite handymen. In Masciotti’s script (gender-schema alert), the man does the manipulating; in Landsman’s, the woman. They both talk too much. They talk more than they have things to say. Dry rub of habit. Ways to inflict pain, maybe, or to keep it at bay. 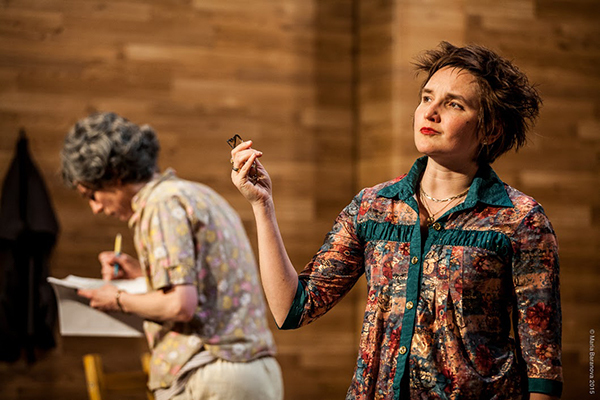 Christina Masciotti’s Social Security, 2015, in a production directed by Paul Lazar. Performance view, The Bushwick Starr, Brooklyn, New York. Photo: Maria Baranova. Structure is a messy business. “The murkiness and ambiguities of a life take on weight and authority by virtue of the published document,” Moyra Davey writes in the opening of Burn the Diaries (2014). I think I think that this is the same whether the life is imagined or actual (which anyway isn’t a black-and-white distinction, as we all know all-too-well by now—is that especially true in the theater?). Both Social Security and Running Away From the One With the Knife resist, or seem to resist, conventional expectations up until the final stretches, at which point they lurch into, as my guest at one of the shows put it, the territory of a Meryl Streep drama. Is this a strategy, a failure of nerve, both? Or does it rather say something about the ways in which artists are now relating and/or responding to something in the water? Are these useful questions? It’s very easy (see “Silly Writer Construct”) to have an idea about how to proceed when you’re following in someone else’s footsteps. It’s very easy to make up your mind, so much so that when time-based art foils this interior audience process it can take a moment to realize you should be grateful. But also, of course, at what point do the ways in which we resist conventional expectations become the new conventions, and why do we remain stubbornly programmed to see this as a bad thing? Or do we? Running Away uses a live pop performance (music by Christian Gibbs, performed with Anton Sword) to tie up some of its loose emotional ends, and Social Security employs a sound score (by Ben Williams) for plot shorthand. The music is a trope, one that somehow manages to keep satisfying, despite (here I suspect individual audience-member weakness). The Social Security shorthand felt less adequate. Both, of course, are overt turns away from the self-sufficiency of language, that good old illusion which is never, ever, gone for good. Christina Masciotti’s Social Security ran February 25–March 14 at the Bushwick Starr in Brooklyn. 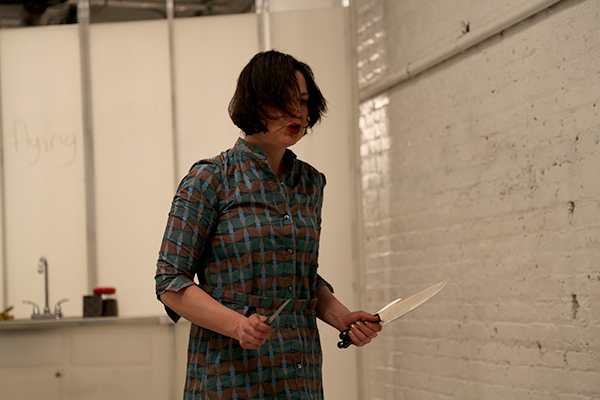 Aaron Landsman’s Running Away From the One With the Knife runs through March 28 at the Chocolate Factory in Long Island City, New York.